Resolutions are funny things- while growth, change, and reflection are terrific processes, they are often rooted in guilt and shame, especially when it comes to health, movement, and weight. If you take a look at most fitness and health marketing, you are bombarded by health resolution posters and promotionals all over the city, from "Battle Your Bulge with us" to "Don't blame the holidays for your fat- it's your fault" to "New Year, New You" and everything in between. Supplements, meal replacement bars, and shake powders were on sale at Whole Foods, and magazines (as usual) featured "5 Quick Moves to Burn Fat/Build Abs/etc." It was frankly overwhelming at times, but it really hit home this big misnomer that your weight or appearance dictates your health, and to many people, your weight dictates your value as a person, which could not be farther from the truth. I'm all for people moving more, trying new exercise things, and eating more plants, but weight is not the most important signifier of good or bad health. Our media culture promotes weight as the sole metric for determining someone's whole health regime, and it tells very little. Let's take a look at the BMI, or the Body Mass Index. This mathematical formula was developed in the 1830's (Seriously.) by Belgian Jacques Quetelet, and the ratio is weight divided by height squared. The number does not distinguish muscle versus fat, and more importantly, the numerical system was developed a long time ago, by male Europeans, meaning that it does not necessarily account for the genetic diversity and gender of actual humans. Some of the themes that have come up over and over again is that of fat shaming, fat phobia, and our cultural response to fatness- some of the statistics around these issues are alarming. 1) There are few protections for people of different sizes, meaning that there have been instances of blatant discrimination. Employers have denied people work based on size, and many workers are paid less if they are heavier. "Obesity was found to lower a woman’s annual earnings an average of 4.5% and men’s earnings as much as 2.3%, according to a 2004 study by Charles L. Baum of Middle Tennessee State University." Statistic from Fast Company. 2) People often discuss bodies, weight, and more in the workplace. (I know I have certainly done similar). By complaining about your weight or complimenting someone else about their weight, you're reinforcing the culture of thinness as the dominant goal, or expectation. Gyms are a place where people love to look at and talk about bodies- what about focusing on performance and tasks, rather than appearance and weight? 3) Most people still have preconceived notions about what a person is like, based on their appearance. A thin person might be diligent and hard working, a larger person might be lazy and careless, and so forth. These concepts could not be further from the truth for so many people- weight does not indicate character, health, or ability to do one's job. The Diet Industry is Big and scary. 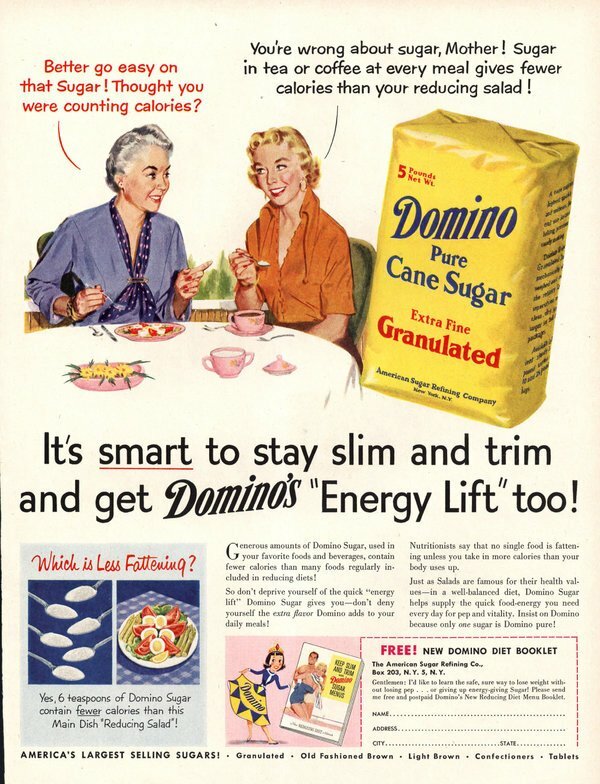 Every company has an agenda and has had one for a long time, even the sugar industry. 4) As a country, we have promoted terrible food choices (fast food, added sugars, sugary sodas, fried things, etc) while simultaneously shaming fat people, who may not even eat such food. Schools and workplaces offer terrible quality food, if any, and many communities are food deserts, lacking anything but processed food. My former doctor's office, which is a combination pediatric, PCP, and endocrinology office has two vending machines in it with sodas (and water), and exclusively junk food, including doritos, packaged pastries, etc. Nothing could puzzle me more, especially since endocrinologists often work with diabetics. 5) As a medical community, doctors often shame and blame any health issue on weight. I have multiple friends who have gone to the doctor for a cold, hand tendonitis, knee pain, and more, only to be told that their weight is a contributor to their issue. Sometimes, this may be true, but if someone comes to a hand doctor (real story, folks) for pain related to playing their musical instrument, perhaps it would best to take them seriously and NOT give a lecture about their weight. As a fairly average sized woman who is generally deemed marginally overweight on the BMI scale, my previous endocrinologist would constantly give me flack about my weight. Mind you, everything in my blood and hormone tests would come back normal, which is awesome given that I have a non cancerous brain tumor. Yet, she would say things like, oh, you gained a few pounds at Christmas. I HATED going to see her, and she wore high heels to work as a medical professional, which also angered me intensely. As a privileged white person with an average body, I can't even imagine the level of body shaming that happens for larger bodies. I saw this advertisement for a gym recently and it just made me mad. I'm all in for stronger and happier, but how does this kind of image affect people of different sizes? 6) As a yoga/pilates teacher, I sometimes am asked by students, "How can I get arms/legs like yours/hers/his/Michelle Obama/etc?" This amuses me because so much of our dimensions are genetic, and the appearance of my body in no way dictates the strength or function. Someone's arms may look toned, but they may be in pain, lack range of motion, or have limitations. I may look strong but I have difficulty doing pull ups and multiple push-ups (though I have improved on that!). Conversely, someone who may not look athletic or sculpted may in fact be a complete badass triathlon competitor. Appearance and function are not the same thing. The bottom line here is that we can't see a body and know anything about health, strength, or more. 7) The fitness, yoga, and pilates community could really use some help in eliminating weight based and aesthetic based content from advertising. I was working at a big national gym chain that had constant media about weight loss and supplements. As a pilates teacher, it was my job to sell supplements- no seriously, if I sold anything, I got a commission. I sold nothing, and I never mentioned weight loss challenges, protein powders, or whatever to my clients. Why? Because I am not a nutritionist and I have NO idea what the @#$& were in those products. If you do have nutritional training, great. If you don't, then stick to your line of work. I've occasionally been asked by clients as to what I eat, and I usually say the truth- some healthy things, some not healthy things, and that I've weighed a range of different weights. It repulsed me that this gym had so much media content that shamed bigger bodies, and what made it worse is that if someone was referred to me, I would receive their statistics for weight and BMI from their intake. Here's the other thing- if someone wants to lose weight, they shouldn't work with me. I teach yoga and pilates, which are not exactly weight loss oriented disciplines, for the most part. I try not to use aesthetic focused language in my sessions, and I don't care what students wear or look like, I just want to help them move better and feel better. People of all shapes and sizes can do yoga and pilates, and there is no one "body type" that is the goal of movement, even though every yoga ad will have you believe it's a thin white woman on the beach doing acrobatics. 8) The classical music world also has implicit fat shaming, and it's not only in opera. Although many musicians can recall different opera singers who were shamed in publications for playing a character of smaller dimension, most classical music media (magazines, ads, and more) are of thin, young people. If we take a look at the back catalogue of Strings Magazine or Strad Magazine, we'll see mostly thin white, young people gracing the covers. 9) Weight loss culture is built on privilege and racism- one has to have a certain amount of expendable income to spend on ridiculous supplements, pills, powders, and green juices, and many of the “ideal bodies” represented are thin affluent white bodies. That culture marginalizes all people who may not fit into that category. One of the challenges I face is looking at the assumptions I carry about other people's appearance, as well as the judgments I make about my own. As I've gotten older, I've seen many friends struggle with their weight after delivering children, as well as friends be diagnosed with hypothyroidism and other metabolic affecting disorders. I've seen how stress impacts my own health, and I've seen how prescription medicine can deeply impact weight, mood, and appetite. I also have tried to diet away my weight in the past with minimal success, and even as a child, was on the larger side of things. I've also seen thinner individuals who never gain weight or muscle, despite all of their attempts. Bodies are diverse and complicated. If weight loss was as simple as eat less or eat this one food, we would've succeeded by now. 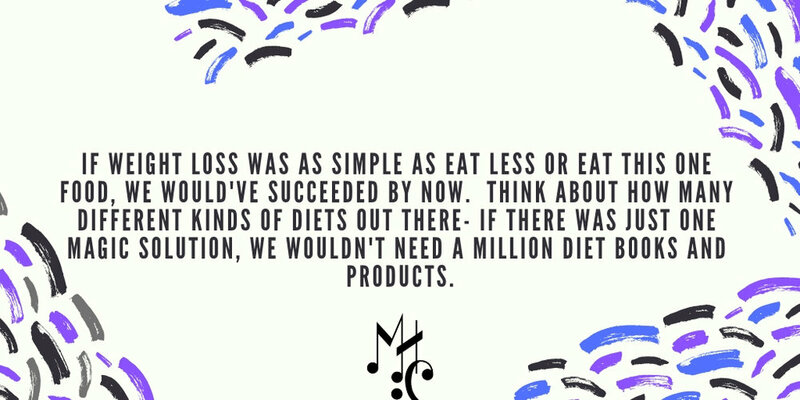 Think about how many different kinds of diets out there- if there was just one magic solution, we wouldn't need a million diet books and products. If we really want to look at health, let's start asking questions like, am I in physical pain often? Are there places in my body that always hurt? How's my energy? How's my digestion? Where are my body blind spots of weakness? Where can I improve my strength? Where can I improve mobility and range? How's my mood and stress? How often do I walk? How well do I sleep? How often do I drink alcohol and caffeine? Could I eat healthier foods more often? How is my cholesterol, blood pressure, etc? Can I do the things I want to do in my daily life? And so forth. Katy Bowman, biomechanist, natural mover, and generally awesome lady. I'm all for people getting motivated to be healthier, but health is so much more than weight loss. One of my movement idols, Katy Bowman, did a year in review podcast a while back on health and wellness accomplishments, and she focused on where she gained strength, added miles to family walks, slept better, and so forth. I loved it, and it made me realize all of my health successes that might not show up on a scale. 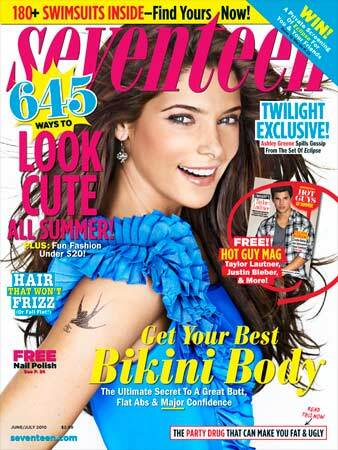 How many magazines have we seen that promoted a Bikini Body with flat abs? The diet industry and magazine industry thrives on making us feel bad about ourselves and our bodies so we will buy the magazines, buy the supplements, and buy the weird diet food. So, if you're feeling that spring/summer weight-loss bug, remember that the U.S. weight loss market totaled $64 billion in 2014, which includes diet frozen foods, diet beverages, and weight loss centers for starters. It's a business that relies on making you feel bad about your weight, appearance, and size, in order to generate revenue. Even if you do want to eat healthier (or lose weight), look at those other markers of health- how you feel, your overall strength, sleep schedule, eating habits, and movement habits to see where you could improve. 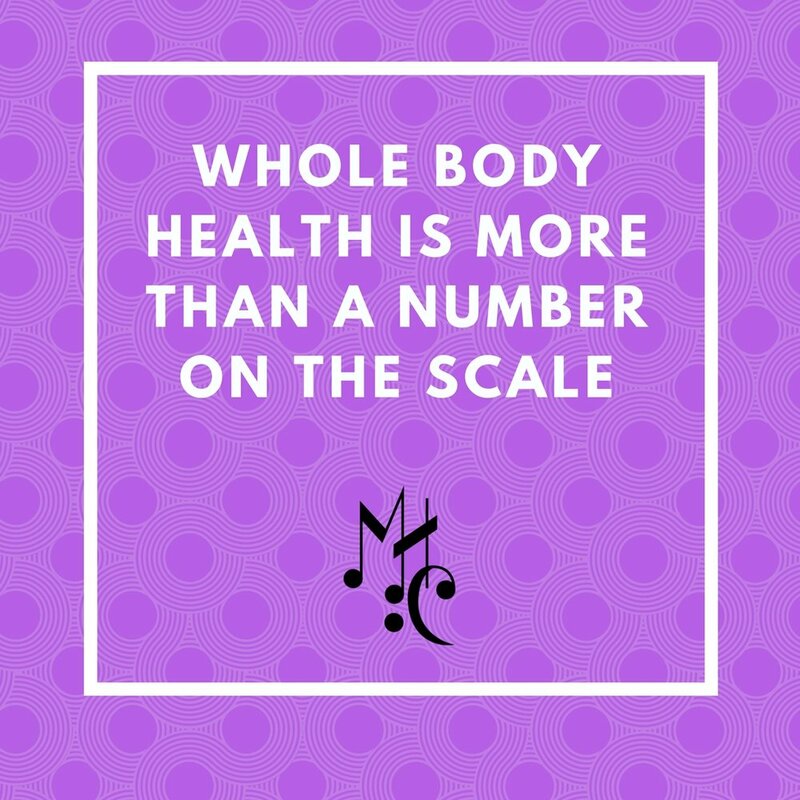 Whole body health is not just a number on the scale and your worth (or someone else's) is not dictated by that number.